My husband and I attend a conference in Minneapolis every fall and this is what I wore. I always try to find something comfortable to wear as the conference always involves both a lot of sitting and a lot of walking: so pants that stretch a little and comfy shoes are a must! The temperature in the room tends to vary year to year, so I try to dress in layers to remove or add as needed. This year, it was so warm, that this thin shirt was all I needed...and I was still hot! I purchased the top at JCPenney back in the spring. It is a loose fitting sheer top, so a camisole underneath is a must. I wore black stretch denim curvy skinny jeans by Levi's (old). They are so comfortable. For comfortable footwear I chose this low chunky heel grey pair by Blowfish (old). 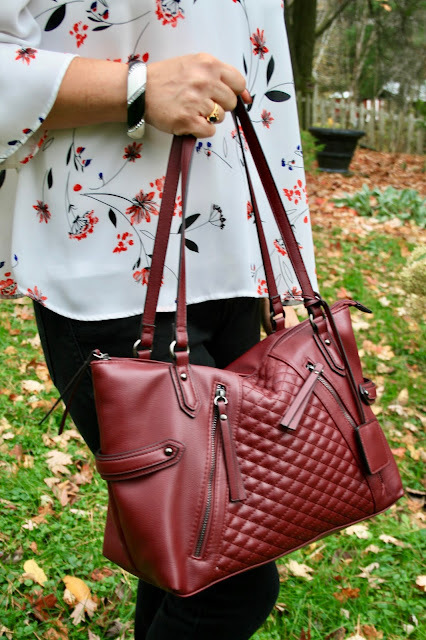 And of course I carried my usual burgundy bag that goes with just about every fall item I own (old, JCP). For jewelry, I didn't wear a necklace because of the choker top (isn't it nice to have a built in necklace with this style of top? ), but I did wear a black and white bracelet and rings. The last time I styled this top for you one of my readers mentioned that it might be uncomfortable because of the choker. It is not at all, but I did buy a size large in this top (I'm normally a medium). It also has two buttons so you can make it tighter or looser as desired. This exact top is no longer available, but they do have a darker floral in this exact same style of top HERE. And here is how I styled this top the last time I showed it to you. 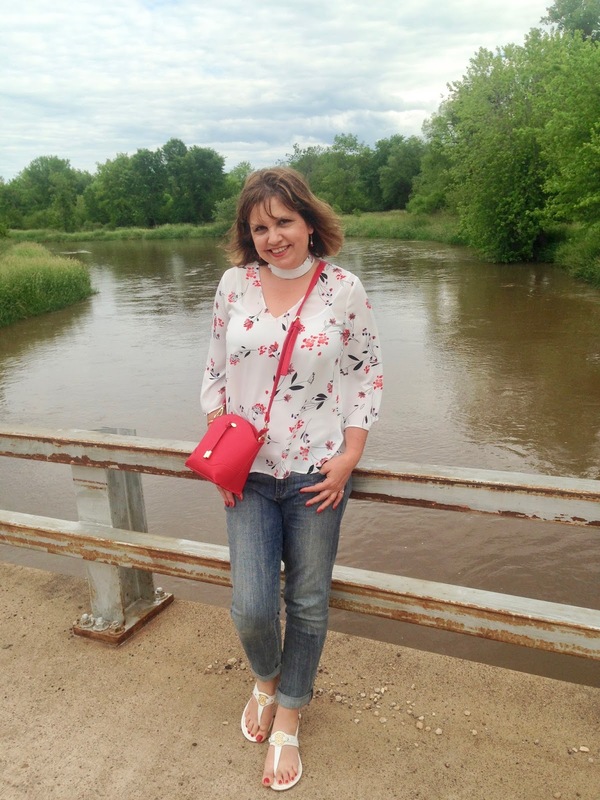 The weather was warm, for it was June, so I wore it with light stone wash boyfriend jeans and sandals. I also carried a brighter bag. What a great look, love the print of the shirt and the purse does go so well with everything. Love that color! I love the choker top trend! I think it looks great! This looks and sounds like the perfect thing for the conference. I love the top, and it is fun to see the other way you wore it too. I have been thinking about your comment for Thanksgiving outfits when you are the cook. That is tough! Thanks Amy! I am leaning at the moment to wearing a short sleeve velvet burgundy top and nice pants, then adding a second layer when I actually sit down to dinner. I was eyeing some choker tops just this morning! This one is really pretty with the subtle floral print. Thanks Carrie! They can be addictive! That top is so pretty! I haven't worn a choker in a long time, but I remember often making my own. The one that comes with that top, however, looks so sweet and finishes off the look rather nicely. Looking really good. Nice fall pictures and you shine like a star. Great match ups, I love the little booties. I love the top - pretty for autumn and the neat trousers balance the floaty top - it all works together really well. Cute as a button, Amy. I'm not familiar with these tops but am guessing that the choker is somehow attached at the back? Lovely anyway. Thank you. Yes, there are two buttons in the back of the choker so you can adjust it to your comfort level. What a gorgeous top, Amy!! I still have yet to find one of these choker tops for me, but soon!! Thanks Jodie! Check out JCP, they have quite a few! Love that you stretched this top from spring to fall! It looks perfect with the beautiful scenery. Thanks for linking with Ageless Style and The Blended Blog Style! I saw this top on instagram and loved it on you! The colors are gorgeous and are perfect for fall! Thanks Ruth! It's one of my favorites! Such a pretty top! I don't own a choker top, but I may have to add one to my wardrobe. Thanks for linking up! This is gorgeous. I love the top and the mix+matching bag and bracelet. I actually featured this on my Thursday Moda yesterday. Did you see it?! Thank you! No, I never saw it. I swear I was just there yesterday linking up with you too! I must have just been looking at your pictures and never checked out who was featured. I'll check it now, thanks for letting me know!